Dad loves his grill, and loves to feed the family. Let him display his next perfectly prepared prime rib on this beautifully engraved cutting board. An everyday carving board, this USA made maple wood board is lightweight, beautiful, and has a five-year guarantee. It is personalized with "World's Greatest Dad " or "World's Greatest Grandpa" or any name you call Grandpa for a very special and welcome gift for Father's Day and other gift giving occasions. 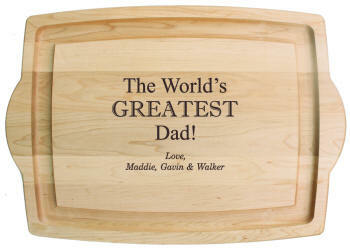 This personalized cutting board for Dad or Grandpa will be well used and well loved for years to come.